Going solar the cheapest way – Reducing solar customer acquisition cost. The cost of going solar for consumers and businesses include hardware solar panel cost and soft costs such as customer acquisition costs, financing costs and permitting which can represent to almost half the cost of residential solar systems. However, thanks to online solar marketplaces such as EnergySage and Pick My Solar which were created with the aim of reducing customer acquisition costs and through the Sunshot initiative- a government initiative to increase the adoption rate of solar in the U.S. According to GTM research, acquiring a solar customer in the U.S costs around 49 cents per watt, which equates to about $3,000 for the typical 6-kilowatt residential rooftop solar. Hence, if we consider the average price of solar to be $3.70 per watt and installation of a 6-kilowatt residential system as an example; the total cost of going solar would equate to about $22,000 before applying tax credits and rebates. Assuming that the tax credits will reduce the total cost by 30%; sales and marketing alone (customer acquisition costs) will account for up to 20% of a residential install in this particular example. However, according to GTM research, customer acquisition costs can account for up to 10 percent of overall residential solar costs. So, how do online solar marketplaces reduce this customer acquisition cost making it affordable for consumers to go solar? 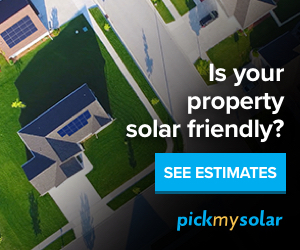 Online solar marketplaces help consumers and businesses to evaluate their cost of going solar. For instance, Online solar marketplaces such as EnergySage and Pick My Solar received technical or financial support from the Government (Department of Energy) under the Sunshot Initiative to provide consumers with online solar tools that utilize a web portal and help them evaluate the cost of solar for their property. Such online solar tools are useful because they help to determine the amount of sunshine hitting the roof of your property while factoring in shading from nearby buildings or trees that might be blocking your property.Hence, consumers searching for how to go solar online are informed on the three most important aspects that help them to decide to go solar i.e. The amount of savings as a result of installing solar panels. Consumer and businesses are also provided with multiple solar quotes from pre-screened solar installers to help them compare and contrast solar quotes enabling them to find the best deal possible based on costs, financing options and the savings to be accrued by going solar. For instance, EnergySage notes that their online web portal aggregates multiple solar quotes for the user and calculates the financial benefits for each offer while presenting them in an easy-to-understand format. By using such online web portals, customer acquisition costs are reduced through these online web portals which the end-user or consumer has control over. For example, EnergySage claims “People who use EnergySage generally save $5,000 to $10,000 as compared to those who only work with a single installer.” and this can be attributed to the fact that, a consumer is able to compare quotes from different solar installers who are already pre-screened in an online solar marketplace. Online solar marketplaces provide a one-stop shop for consumers and businesses interested in solar and equips consumers with great information ranging from how to finance their solar panels; consumer solar reviews, financing and other solar educational information to empower the consumer to make a more informed decision about going solar. So, what’s next? You can create a profile with one of these online solar marketplaces and see how much you can save with solar. Get started with EnergySage or Pick My Solar online marketplaces.